Compare discounts for Hotels Motels Resorts in Destin, Fort Walton Beach, Florida! Destin and Fort Walton are not the small fishing villages they used to be, but rather a major tourist attraction offering something for everyone. The white sandy beach of Destin and Ft. Walton is considered best in the nation. Complimenting the stunning beaches, are endless water sports, fishing, snorkeling, scuba diving, parasailing, and all types of boating. Some of the finest golf courses in the country are located in the Ft. Walton and Destin area. An abundance of courses are conveniently accessed right in the heart of Destin and many area resorts offer golf packages. Note: Lists are not identical. 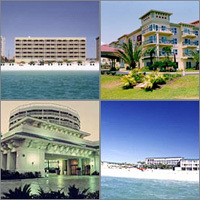 Different sites offer different accommodation options for Destin. This Destin hotel 2 miles from a small airport is a 200-yard walk from a public beach on the Gulf of Mexico. Complimentary Continental Breakfast, Walking distance to Gulf of Mexico, Elevator and Exterior Corridors, Outdoor Parking for Cars and Trucks. Situated on Florida's Emerald Coast, the Hilton Sandestin Beach and Golf Resort is Northwest Florida's premier luxury gulf-front hotel. The hotel is on what is rated as the best beach in the US and is part of a 2400 acre playground nestled between the Gulf of Mexico and Choctawatchee Bay. The Days Inn Destin is a designated Chairman's Award winning property due to its commitment for strict standards that consistently exceeds the expectations of the guest. Across the street from Silver Sands Outlet Shopping Center. Close to restaurants. Beach 1 mile. Located just north of scenic beachfront Old Highway 98, Surfside is close to world-class shopping, golf, fishing, and is less than 150 feet (via elevated walkway) from the World's Whitest Beaches. Carved from 2400 spectacular acres of sugar white beaches and pristine bayfront along northwest Florida's Gulf Coast, Sandestin Golf and Beach Resort boasts an unrivaled resort location. The Summit at Tops'l Resort is the ideal combination of luxury and value, with close proximity to the USA's most beautiful beaches. The Best Western Ft. Walton Beachfront Hotel is located directly on the sugar-white beaches and sparkling gulf waters of Ft. Walton Beach's Okaloosa Island. The Comfort Inn in Destin, is a two-time Gold Award winner and the 2002 Choice Hotels International Inn of the Year! Holiday Inn Destin is a full service hotel located directly on the Gulf of Mexico. A property wide renovation was completed in March of 2001. The Embassy Suites Destin is located directly across the street from the Gulf of Mexico's pristine, white sandy beaches with a designated boardwalk for access to fun in the sun. Whether on an early morning hunt for shells or enjoying a view exclusive to the Florida Gulffront, there's nothing like the feeling of sinking your toes into the soft sugar-white sand of Florida's Radisson Resort, Fort Walton Beach. This Destin, Florida hotel is located off Highway 98, between Choctawhatchee Bay and the Gulf of Mexico. This high-rise condominium resort is located just across from the gulf and 4 miles from downtown Destin.